Around 100,000 years ago, the diversity of large kangaroo species went beyond the grey or red mammal you are most familiar with today. A study released Wednesday in the journal PLOS One examined the extinct Sthenurine kangaroo family, which researchers now suggest were “hop-less monsters” with rabbit-like faces, some attaining giant proportions. While all kangaroos hop to move rapidly, they use pentapedal locomotion — the four- legged plus tail movement — at slow speeds. The Pleistocene members of the Sthenurine family are fundamentally different. The findings all come down to differences in anatomy and weight, which would have made the Sthenurines poor hoppers that were unable to do this slow pentapedal gait. Research began in 2005 in a joint investigation between Brown University and the University of Malaga in Spain. The extinct Australian animal had a small face and long fingers, according to the study. 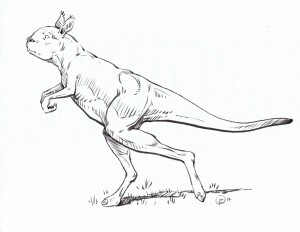 Sthenurine kangaroos were most likely bipedal walkers with a lumbering gait. They moved one foot in front of the other while standing upright. This meant they had a sturdy versus flexible backbone, which we see in the large kangaroos today as a necessity to hop great distances quickly. Some species weighed 550 pounds – that’s up to three times more than modern species. In comparison, the Sthenurines also had really big butts — similar to what a human needs to balance body mass whilst walking. The pelvis was flared and wide to support the gluteal muscles. Other physical differences include the anatomy of their ankles, hip and knee joints, and their big bones. As identified in earlier studies, Sthenurines had large hands with two especially long fingers for foraging. This coincides with the idea that the two front legs are ill suited for bearing their weight in a pentapedal walk, forcing them to adopt a new type of slow locomotion. Lead researcher Christine Janis, a professor of ecology and evolutionary biology at Brown University, believes in their reliance on walking. She also noted that it may have been this gait that allowed some Sthenurine species to evolve to giant sizes, where the body weight would have limited the ability to hop. The research was not able to explain why the Sthenurines went extinct. Janis speculates they may have had trouble escaping human hunters, who first arrived in Australia shortly before the Sthenurines disappeared, or were not able to travel efficiently for food when the climate shifted to more dry.